Trust is created when one party takes a risk, and the other reciprocates positively. Think of a handshake offered, and returned. We saw in Part 1 that one player does the trusting, and the other is trusted; the one doing the trusting is the one taking the risk. That’s true – but only for the instant of that trust transaction. Trust is rarely built on one exchange alone, and the roles cannot stay fixed. If you focus on being trustworthy, and your client trusts you, good for you. You can play that game for a while, but eventually your client will notice, ‘Wait, I’m taking all the risks here – what’s up with that?’ And at that point, they will stop trusting you. You cannot escape the need to trust, as well as to be trustworthy. You have to take a risk too. Virtue may be its own reward, but unless you season virtue with risk-taking, you won’t get trust out of the recipe. To use an electrical metaphor, trust is not like direct current, moving in one direction – it’s alternating current, constantly changing direction. In this brief series, I’ve claimed that “all you need to know” about trust is these three propositions – trust takes two players, it requires risk, and it must be reciprocating – and that you can deduce the rest. Let’s test that claim. Organizational trust. You may have noticed all my points have been about personal trust. What about organizational trust – trust in corporations, congress, the professions? You can design corporate cultures to either encourage or discourage trusting and/or trustworthiness. And that’s pretty much it. Corporations may legally be people, but in the court of human nature and trust, they are largely environments which condition trust – they are not agents of trust themselves, only people are. Trust, Virtues, Values, and Risk. The tools of individual trustworthiness can be found in the Trust Equation. The tools of individual trusting are about socially acceptable risk-taking. The tools of organizational trustworthiness and trusting – because organizations are environments for trust enhancement – can be found in the celebration of virtues and values. Virtues are the personal attributes of trustworthiness – encouraged socially. Values, or principles, are a set of guiding beliefs that govern interactions with others. 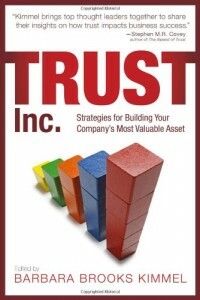 Since trust is about relationship (remember Part 1), values drive the environment that creates or hinders trust. Among the most powerful trust-enhancing values are collaboration, transparency, and a long-term perspective. Organizations run along those lines create trust wherever they touch. Trust Recovery. The business world frequently confuses “trust” with reputation, image, or poll ratings. This leads companies with trust problems to seek PR firms to focus on improving their reputation. When your real trust levels exceed your reputation, you have a communications problem. When your reputation exceeds your real trust levels, you have something a lot more serious, and throwing communications-only solutions at it is like throwing water on a grease fire. Trust broken can be recovered, by the three basic principles above. It requires engagement by both parties, it requires risk-taking (particularly on the part of the offender), and it must be reciprocal. The biggest threats to trust recovery are an inadequate acknowledgement of the degree of rupture, and a refusal to accept the values required to change the state of trust. Restoring Trust. The social issues facing us from lack of trust are real, and important. They can be addressed using the three principles above. First, our trust crisis is not due to a global increase in the birthrate of morally impaired people. As noted in Part 1, trust is two-party game. It is about relationship. Trust failures are failures of relationship. Where we have lost trust, we have lost the ability to interact in relationship with others. There are many reasons for this, including business thought leadership, an over-reliance on market solutions, and increased wealth disparity. All of them have emphasized the individual over the group. If a trust issue sounds complicated, you’re over-thinking it. Go back to basics. There are only three things you need to know about trust, the rest you can deduce.